Wishing you all a happy new year filled with good health, laughter and love. Materials: 10/12/13/15 balls of Debbie Bliss Fez in Chocolate, Color #03. Pair of each U.S. 7 and U.S. 8 knitting needles (4.5 & 5mm). Long U.S. size 8 circular needles (5mm). Gauge: 18 stitches and 24 rows for a 4 inch by 4 inch square in stockinette stitch with U.S. size 8 needles. To download the pattern please click on this LINK for page one & this LINK for page two. Please note that these are large files and the download may take a few minutes. We finally finished posting all the beautiful colors of Debbie Bliss Fez, which is made of 85% extrafine merino and 15% camel. Simply put Fez is beautiful. 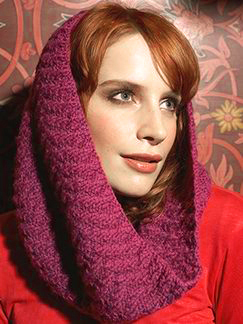 It is soft, plush and knits & crochets like a dream, and comes in lovely color lines. It is also on sale at 60-65% off at our store and at our website. Materials: Two balls of Debbie Bliss Fez (shown in color 511). U.S. size 8 circular needles (5 mm). Finished Size: Approximately 33.5 inches. 1st and 2nd rounds: [P2, k2] to end. 3rd & 4th rounds: P1, [k2, p2] to last 3 stitches, k2, p1. 5th & 6th rounds: [K2, p2] to end. 7th & 8th rounds: K1, [p2, k2], to last 3 stitches, p2, k1. 9th & 10th rounds: [P2, k2] to end. 11th & 12th rounds: K1, [p2, k2] to last 3 stitches, p2, k1. 13th & 14th rounds: [K2, p2] to end. 15th & 16th rounds: P1, [k2, p2] to last 3 stitches, k2, p1. These 16 rounds form the pattern and are repeated throughout. Continue in pattern to the end of the second ball of yarn leaving just enough yarn to work the cast off row. Cast off, weave in loose ends, lightly block and enjoy. A free pattern for the super soft and superchunky Debbie Bliss Como, a merino/cashmere blend with a great next to skin feel, provided by our gracious distributor. I should have stashed some away now I am desperately seeking at least 4 skeins in Sienna or Red. Materials: Four 50 gram balls of Debbie Bliss Como (shown in Denim 07). Pair of each U.S. 8 (5mm), and U.S. 15 (10mm) knitting needles. Tension: 11 stitches and 12 rows to 4 inch/10cm square over daisy stitch pattern using U.S. 15 needles. Band With U.S. 8 needles cast on 81 stitches. 1st row (right side) P1, [k1, p1] to end. 2nd row K1, [p1, k1] to end. These 2 rows form rib. Rib 4 more rows. Crown Change to U.S. 15 needles. 1st row (right side), K.
2nd row K1, [p3 together but do not drop stitches from left needle, yarn over (yo), p same 3 stitches together (tog), and drop off left needle, k1] to end. 4th row K1, p1, k1, (p3tog but do not drop stitches from left needle, yo, p same 3 stitches tog and drop off left needle, k1] to last 2 stitches, p1, k1. These 4 rows form daisy stitch pattern and are repeated. Continue pattern and work 21 more rows, ending with a 1st pattern row. 1st row (wrong side) K1, [p3tog, k1] to end. 41 stitches. 3rd row K1, [p3tog but do not drop stitches from left needle, you, p same 3 stitches tog and drop off left needle, k1] to end. 6th row [Ktog] 9 times, k1. 10 stitches. 7th row K1, [p2tog] 4 times, k1. 6 stitches. Leaving a long end, cut yarn, thread through remaining 6 stitches, draw up and secure. Join seam. Size: Approx. 93 inches (235 cm) long and 8 inches (20 cm) wide. Materials: Nine 50 gram balls of Debbie Bliss Como. Pair of U.S. 36 (20mm) knitting needles. Tension: 5.5 stitches and 8 rows to 4 inch square over moss stitch using U.S. 36 needles and double yarn. With two strands of yarn held together and U.S. 36 needles, cast on 11 stitches. Moss Stitch Row K1, [p1, k1] to end. Repeat this row until work measures approximately 93 inches (235 cm), from cast on edge or until the last ball of yarn is almost finished, leaving just enough yarn to work the cast of row. Cast off.